THE WAND® doesn’t look like a traditional syringe, so the patient’s initial apprehension is minimized. 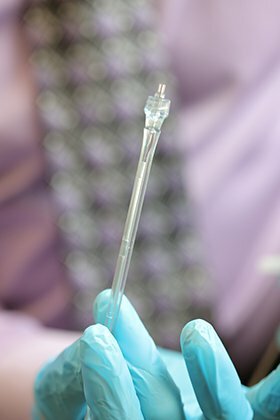 During the actual injection, the development of an anesthetic pathway combined with computer controlled constant flow assures that there is minimal awareness that the injection is even being given. THE WAND® represents the first major technological advance in anesthetic delivery since the syringe was first invented nearly one hundred fifty years ago. This computer controlled “Novocaine” delivery system conquers fear of pain and anxiety. Dr. Steinberg gives his patients the highest quality dental care while addressing their concerns about the pain, fear and anxiety associated with standard syringe injections. THE WAND® can be positioned more accurately and has a controlled novocaine flow rate. This provides quicker numbing of the teeth, without the usual numbness of the tongue, lips and face. This computer controlled anesthetic delivery system also eliminates that “fat face feeling” that can last for hours. THE WAND® effectively controls the flow of novocaine, delivering the correct amount of anesthetic at a rate that is painless. The source of most discomfort from novocaine injections isn’t the needle. It’s the flow of the anesthetic into the tissues of the mouth. Unlike traditional syringes, the Wand delivers anesthetic at an optimal flow rate for a comfortable, pain-free injection.